by Bill Dwight on Thursday, January 21, 2010 at 1:32 AM | LEAVE A COMMENT! It's 2:23AM PST, and the "Coming Soon" sign is finally down. 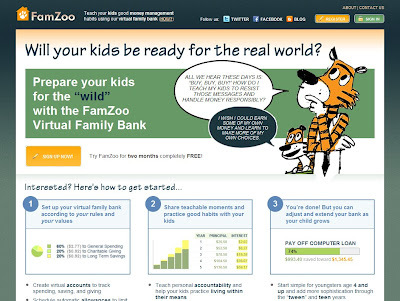 FamZoo is now open to the public! Drop us a line, and let us know what you think. Got suggestions? Fire away! Our Contact page is here. Our Twitter is here. Our Facebook is here. Or, leave a comment right here on the blog. A very hearty thank you to our 100+ Charter Families! You've been a wonderful source of ideas, inspiration and validation throughout the (multi-year - gasp!) Charter Program. Now, on to the second leg of the journey!